Thanks to our Media, everyone is well aware of their favorite Bollywood celeb’s life style, likes, dislikes, eating hobbies and what not. Not only this, Bollywood star kids are also getting special protocol. From their hobbies to career plans our media has valued everything like breaking news. From Sri Devi’s sweet daughter Jhanvi Kapoor to SRK’s Mr. Attitude son Aryan Khan all of them are superbly stylish and ruling the internet pro. I am sure, after reading this description you must be eager to know about more regarding these star kids. For your ease I wrote a List of Bollywood Star Kids just skim down and read interesting facts about charming kids of Bollywood divas. Beautiful actor Pooja Bedi’s daughter is an open and bold girl. She has inherited charming look and acting skills from her mother. Soon, she is going to appear on silver screen. Recently, she posted a clear and loud blog against her haters who gave negative comments on her pictures. She gave an earsplitting message to the world that “I am more than my breasts.” Alia said she doesn’t care about cyber bullying as it’s none of her business. Jackie Shroff’s daughter and Tiger Shroff’s sister has grown up charmingly. She is a firm and bold lady. She call herself a Lovegen. Currently, she became face of her friend’s project that includes her bold and open pictures that she posted on social media. As a consequence, she faced a critical media controversy. All Shroff family stood with her at this time showing a great family support. Krishna is a diva herself. You can visit her profile, it mostly contain promotional pictures of her films and her stunning pictures of course. Naveya Naveli Nanda is the granddaughter of the most admired Bollywood diva Amitabh Bachan. She is a beautiful and talented girl. She gained lot achievements beyond being in legacy of Amitabh Bachan’s granddaughter. She was firstly recognized when 25 girls were chosen for Parisian Le Bal des Debutantes. Her family is very proud on her this acheivment. She is a charming lady with shinning eyes. Her Nanu Amitabh Bachan loves her a lot. He keeps posting her beautiful pictures at different platforms. 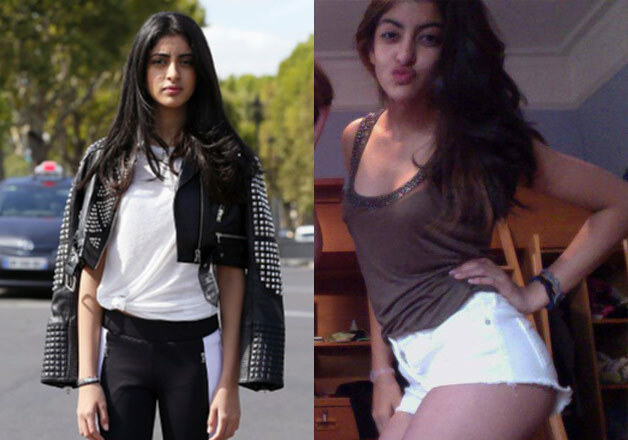 Naveya Naveli Nanda is favorite star kid of paparazzi as well. How can you forget Blue Eyed kid of Bollywood Aarav Kumar! Akshay Kumar has two kids Nitaara and Aarav. 15 years old is quite media shy. Akshay also wants to protect his kids from media. But it’s impossible to hide such a cute boy from media. Last time Akshay posted Aarav’s picture with Prime Minister Narendra Modhi in which he was pulling Aarav’s cheeks and called him “good boy”. Khiladi Kumar wants his son to make career in sports. Aarav is also quite interested in sports. This blue eyed boy dreams to achieve high goals I life. With the support and love of his superstar father he will achieve his destination. There is no need for introduction ofthis guy who resembles all and all his father Saif Ali Khan. Ibrahim is younger son of Saif and Amrita. He has inherited the trait of acting from both of his parents. He made his first debut in the Bollywood film “Tashan” in which he played the role of younger Jimmy. Ibrahim Khan is a Party Monster. He does not hesitate to face camera. Well recently, he was in pictures with Aaliyah Kashyap and Khushi Kapoor and with this he was ruling the internet pro. Have you seen a beautiful girl with stunningly resembling features with Nutan, Pranutan Bahl the veteran diva! She is the daughter of popular Bollywood actor Mohnish Bahl. Well, it’s not clear that whether this pretty girl is interested in acting. But if she did, believe me, she is going to rule Film Industry like a Goddess. Netzens have recognized her glamorous talent and made her their brand face is actually going superb. King Khan’s hot daughter Suhana is a head turner indeed. She is a biy media shy, but her look in Vogue series is extremely awesome. On SRK’s 50th birthday he told the wirld about her pretty daughter’s acting goals. Being a lovely fathr he will of course help her daughter to fulfil her dream. Suhana is a daddy’s girl indeed. Don’t believe it? Check her Profile you will find SRK all around. Well, the sum up statement is that soon Bollywood will get a spectacular actress with a Royal legacy Right? Sara Ali Khan is younger daughter of Saif Ali Khan and ex wife Amrita Singh. Daddy’s girl is ready to make her first Bollywood debut in Rohit Sethi’s new film Simmba in which she will be playing counter part of Ranveer Singh. Saif Ali Khan is a quite liberal father he does not intrude his kid’s privacy and career decisions. She shot for a magazine with her mother Amrita and her look in that ma gazine was strikingly gorgeous. Here comes the cutest daughter of the most beautiful woman in this world. Aradhya is Abhishek and Aishveria Rai’s only daughter yet. With legacy to her parents and family she is one of the richest kids of Bollywood stars. She owns assets in India and Dubai as well. She is the luckiest girl born with a golden spoon. She is not less than any royal princess.